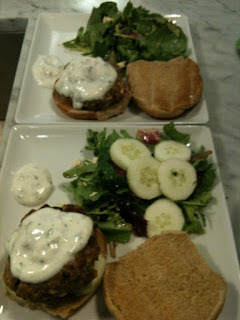 Last night, Laura & I made an amazing - and healthy - Greek Turkey Burger. Laura found the recipe from a cookbook created by Bethany from 'Real Housewives of New York' (just to be clear, I do *not* watch that show). Besides being healthy, the burger was amazing! We paired it with a simple mixed greens salad with feta cheese & balsamic vinaigrette. 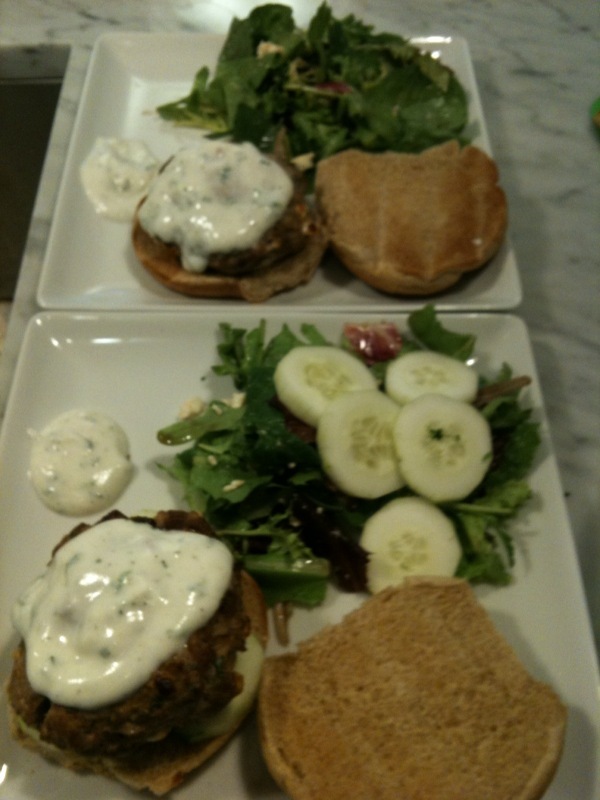 Laura elected to add cucumbers to both the burger & salad. In a medium bowl, combine the ground turkey, parsley, pepper, salt, Worcestershire sauce, mustard, garlic powder, and feta. Make 4 equal patties of ½ cup measure. Put the patties on a broiler pan lined with foil and sprayed with cooking spray. Broil the patties for 5 to 6 minutes on each side, or until done. Place each burger on the bottom half of the bun, top with onion slice. In a medium bowl combine the yogurt, 1 tsp parsley, lemon juice, salt, and pepper. Top the burgers with the sauce and garnish with more parsley, if desired. Cover with top of bun. Apparently a prototype iPhone "4G" was found on the floor of a bar in San Jose. My biggest question is -- how many people lost their job for that royal screw up?! I'm not surprised that McNabb was traded. But I'm shocked it was to the Eagles' NFC East rival, the Washington Redskins. I'm a Cowboys fan and everyone hates the Cowboys. Especially fellow NFC East rivals: the Giants, Redskins, and Eagles. The Redskins, in my opinion, are the least hated team on the NFC East. Granted, much of that can be because the Redskins haven't won the NFC East since 1999. Now, with McNabb playing in Washington - get ready for a new rivalry! Most Eagles fans are probably excited to see Kolb step up as starter. But how bout Michael Vick now at the #2 spot?! Is it football season yet?! Everyone is complaining that the iPad "isn't a laptop replacement." I agree. But - there's an app for that. Once RealVNC releases an iPad version -- it's all over. Keep in mind, too, that the iPhone/iPod version will work on the iPad. VNC Viewer allows you to take control of your PC or Mac from *anywhere*. Want to watch a Hulu video on your couch? Open VNC Viewer, connect to your computer, and watch Hulu.com on your computer's browser. Simple as that. There are already some VNC applications ready at the iPad's launch, such as "iTap VNC Client" for $7.99. I'm a fan of RealVNC so I sort of have a bias. Finally, LogMeIn has released an update to their Ignition app, which is great - but retails for a hefty $29.99. Now, all I need is an iPad! I've held out from the gym craze in NY for more than 3 1/2 years. Last Tuesday, I gave in. I hate failing. In order to be held accountable - I'm telling the world: By this summer - I will be in great shape. I have a vacation coming up pretty soon. Unfortunately, my goal cannot be obtained by then. But by June -- it's going to be a different story! Yesterday, it dumped 9 inches of snow in Central Park. Not bad for this southern boy! All I could think about at work was, "man, I really want to sled in that!" Anyways, last night, we thought it would be a great idea to get outside and go for a stroll through Madison Square Park -- with the destination of Shake Shack in mind. If you haven't had a burger from shake shack, I'd highly recommend you fix that at your earliest convenience! I put some pictures on my flickr page. Enjoy! You probably have noticed that Google Buzz is getting a lot of, well, buzz. It showed up on my Gmail this morning and I have been busy playing around with it every free chance during this snowy day in New York. 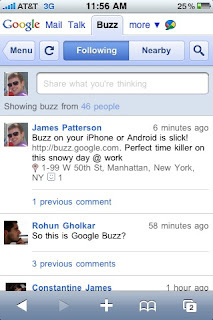 Google Buzz is like Twitter or Facebook's Status Updates -- just integrated into Gmail. The mobile experience is awesome. As long as you're okay with sharing your location with strangers, Buzz allows you to attach your location to every update (or tweet, buzz, etc.). Then, you can take a look at a Google Map mash-up and see everyone else's updates near you. Creepiness aside, it's really cool! Already on Twitter and not ready to jump ship? 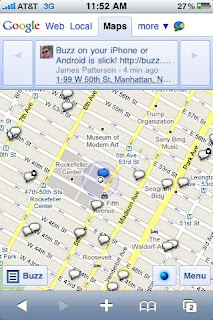 Google Buzz can integrate your public Twitter posts and pull them into Buzz. Sold. Here, you'll find my thoughts on anything that sparks my interest - from technology, breaking news, to wine & beer. Enjoy!